I am pleased with the finished sweater and am planning on taking it out on it's first night out this evening! 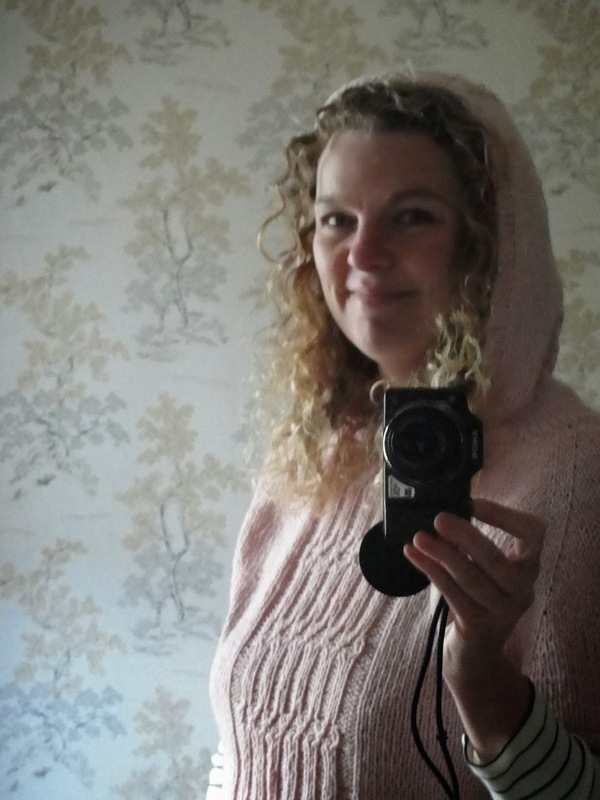 The hood is plenty big enough, I have a huge head and lots of hair, so I made sure I added some more to the mix when measuring against the pattern. 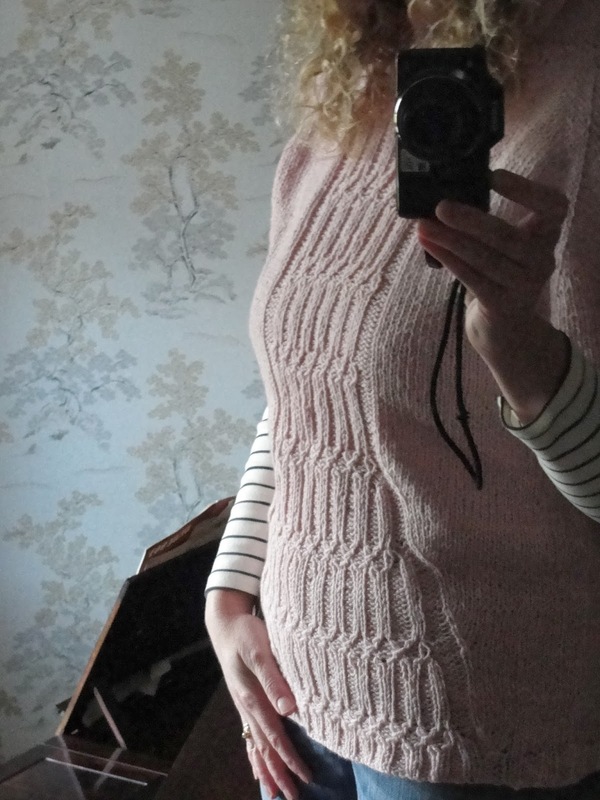 I did the same with the length as I can't stand a jumper which you have to keep pulling down...apart from that and my 'make-it-up-as-you-go-along method' of widening the cable section, its pretty much as the pattern says. I used some nice Rowan Silky Tweed in Bolero, size 5mm circ needles and off I went. I'm quickly onto the next project...no dilly-dallying as this is a gift that needs to be done this week. 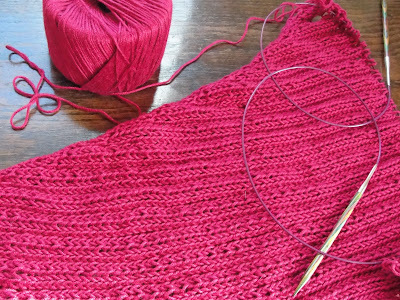 It is Clapo-Ktus which is knitting up a storm (now that I understand what I have to do!). This will hopefully be done in the next few days and then I'm slightly off-piste with some Christmas knitting....I think I may be off-piste a while! Last, but not to least, my little give-away from last week. I'll email you now so I can pop your goodies in the post! 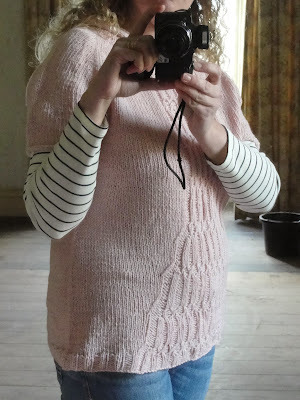 To catch up with my fellow YOP-ers, check out the ravelry page here. Fantastic jumper! 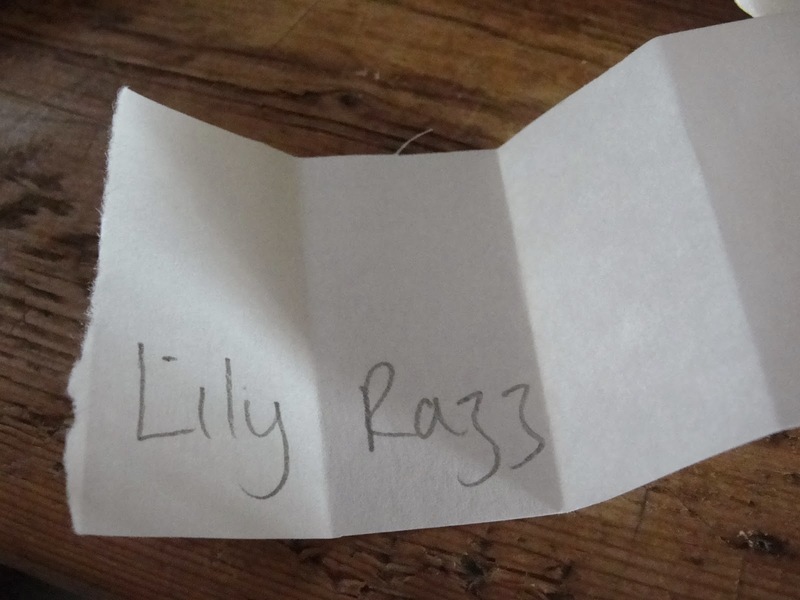 And congrats to Lily Razz! Pretty jumper. The stitch detailing is wonderful. You look cozy. Your jumper is wonderful well done on the finish. 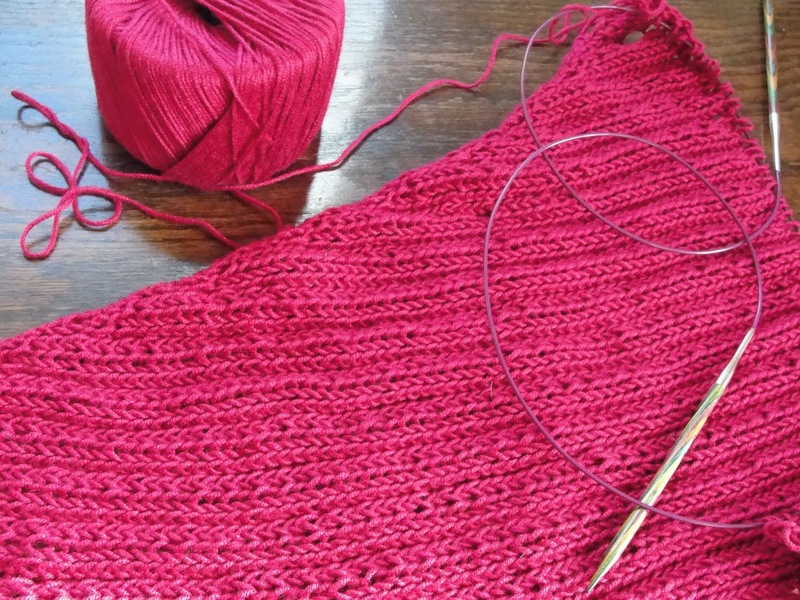 The Clapo-Ktus works up so quick, I've done one in a cherry red and it's such a great shawl. Oh I am so lucky to win your lovely give-away!! Yay ^_^ That sweater looks amazing on you, I really love the soft color.. And now Clapo-Ktus, you're on a roll! Ps. I'm so jealous of your curlies! Lovely jumper and I do like that it has a hood too. 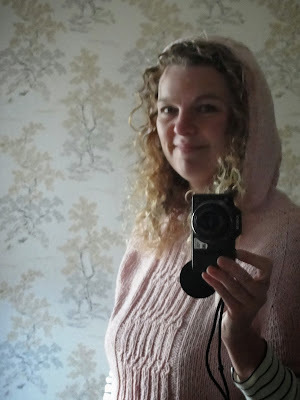 I am quite keen on hoodie sweaters :-) A very nice light colour. Congrats on the finish. The sweater is gorgeous. Gorgeous sweater Faith, it is a fabulous color and you did an amazing job. I knew that was a Clapo-ktus before I even read about it, it is going to be amazing. This is great! What a wonderful fit and I'm glad you modified it to fit your hair into the hood without getting "hat head." Well done on the jumper Faith, love the hood idea. I'm sure you'll get plenty of wear out of it. Always extra layers needed when there's no central heating (our house). Wow, the sweater looks great ... it's such a lovely shade too (for some reason I thought it was cream, but the pale pink is even prettier). You are brave to make up cable expansions as you go! I like those wood floors in the background too ... they look like the ones in our house, with different wood around the edges than in the middle where the carpet used to be. I know what you mean about the blocking taking ages... even in our house which does have a little heating, I keep turning the thing over like a pancake and wondering why it's still damp after two days? I had guests for the holiday here so didn't get posted on Ravelry or see anyone else's. But I have you in my blog list so there you were in your gorgeous sweater/jumper! You are such a great knitter and it looks perfect from here. I can't imagine me ever getting that good but there are Christmas miracles so you never know! I love the shawl/wrap too in that lovely hot pink...what a pretty pattern too. I've never seen anything like that....what a lovely gift that will make. What are you making for Christmas gifts? I was doing pretty good and then with house guests and cleaning before and after and cooking....I am now behind! LOL! But we had a great holiday together and people are way more important than yarn but I need to get back at it now. It's part of how I enjoy the days leading up to the big day! Stay warm! Hi Faith! Just wanted to let you know I received your parcel tonight! Yay! ^^ I'll make a picture and post on my blog about it soon! Wow hon your jumper is stunning! I am completely envious of your talent.